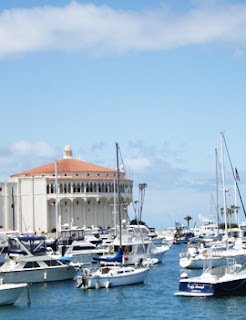 As impulsive as it sounds, William Wrigley Jr. had never set foot on Catalina Island before he purchased it in 1919. He and a partner bought the 76-mile island based on nothing more than a few postcards. He didn't know it was mountainous. He thought it was flat. All that would quickly change on his first visit to the island with his wife. When she awoke on the first morning, Mrs. Wrigley walked to the window and excitedly called out that she would like to live there. "I joined her at the window," Wrigley said. "The sun was coming up. I had never seen a more beautiful spot. Right then and there, I determined that this island would never pass out of my hands." Wrigley meant it. When he and his original partner couldn't agree on how to best develop the island, Wrigley bought him out and took sole ownership of it. Shortly after, he began improving island with public utilities, adding hotel accommodations, building bungalettes, designing landscapes, hosting spring training for the Cubs, and finishing construction on what has become known as the iconic Casino (above). To transport people to and from island, two passenger ships (SS Avalon and SS Catalina) would ferry them back and forth as part of his "day trip" concept. It worked better than he could have ever dreamed. In 1919, 90,000 people visited the island. In 1930, total visitors reached 750,000. More than that, Catalina became more than a resort destination to Wrigley. It was his family's home. His son, Phillip Wrigley, felt the same way. In 1975, he created the Santa Catalina Island Conservatory to protect the the island's natural and cultural treasures. That decision preserved the majority of it. Avalon is unlike any other escape, less than an hour from Los Angeles. Avalon is the primary community (one of two) on the island. The name was taken from Alfred, Lord Tennyson's poem "Idylls of the Kings" by one of the first developers hoping to transform the island into a resort destination before the Wrigley family acquired it. Today, it's the primary center of activity. The Mediterranean-style streets are nestled around the waterfront of the mostly rocky harbor; although there is a small sandy beach area that children will enjoy. The shops that line the waterfront are an eclectic mix of resort and sportswear, art, jewelry, and specialty gifts. The harbor town is especially pedestrian friendly. Cars are rare compared to golf carts, which are the more common means of transportation (although you won't need it). There are dozens of places to eat around the island, both quick eats and sit down. There really aren't any to avoid, but there several standouts such as Ristorante Villa Portofino, an Italian restaurant, leaning Tuscan; and Avalon Grille, which is mostly continental with an emphasis on seafood and steak. Interestingly enough, breakfast always reminds diners that the first European explorers visiting the island were Portuguese. Although sailing for Spain, it's some of the Portuguese influence that survived, including linguica as a staple for breakfast. During the summer, the island hosts a summer concert series, mostly rock, every other weekend. There are other events on opposite weekends, including an exceptional Fourth of July celebration with a four-hour concert and fireworks over the bay. The island also hosts first-run movies in the historic Avalon Theatre. Originally designed for orchestras and live theater, it's now one of the more glamourous movie theaters in the world, with Art Deco murals by John Gabriel Beckman. Avalon is the launch area for island adventures year round. Outside of town, there is a surprising number of things to do on or near the island, especially for those with an affinity for water. The island has always been known for its sports fishing, scuba diving, snorkeling, kayaking, and sailing excursions. Most excursions are reasonably priced, and those chartering sailboats might catch a glimpse of dolphins and sea lions, depending on the time of year. On land, there are plenty of hiking, biking, and walking activities right around Avalon. But beyond that, there are off-road, eco-, and wildlife sightseeing tours that will take you deeper into the interior of the island. Spotting buffalo is especially fun. They were originally introduced to the island in 1924 for a film. While there are a number of hotels on the island, Hotel Metropole (named after the original hotel that was destroyed in a 1915 fire) is comfortable for a reasonable price. The location of the hotel lobby sometimes throws people off because its front entrance is located on a side street (or at the back of Metropole Marketplace). Requesting an ocean view is almost a must because most rooms have courtyard views, which mostly look down a maze of shop frontage. The mini suites are especially well appointed with their own private balconies and Jacuzzi tubs. The real magic of the hotel is its ideal central location, just a few steps from the small harbor beach I mentioned earlier. 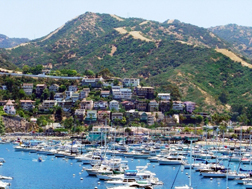 Catalina Island Raises Escapes To 9.1 On The Liquid Hip Richter Scale. While the review encompasses the entire island as an escape, the Hotel Metropole with its friendly and accommodating staff easily adds to the experience. If you do stay at Hotel Metropole, the outdoor hallways might surprise you while heading to your room (they overlook back rooftops), but you'll feel at home inside the rooms. Most of the time you won't be inside. Even if the weather casts gray skies and misty rain, you'll want to be outside. Traveling to the island is easy enough. You can save up to 60 percent from Fare Buzz to Los Angeles. From Long Beach or Dana Point, there are ferries departing every two hours (on average). Fares are an additional $70 for adults ($55 for children under 12).